Elected officials joined residents to protest a DOE plan to rezone two buildings within the Lincoln Towers complex. UPPER WEST SIDE — Elected officials have joined local residents in protesting a move by the Department of Education that would change where local students attend school — saying the decision would "fracture the community." Residents of Lincoln Towers — a large apartment complex along West End Avenue between West 67th and 70th streets — have been fighting a plan by the DOE that would send some children from the complex to P.S. 191 instead of the high-achieving P.S. 199. Under the plan, which has not been voted on yet, students from two of the six buildings in the complex would be zoned to attend P.S. 191, which earned a controversial "persistently dangerous" designation from the state last year. 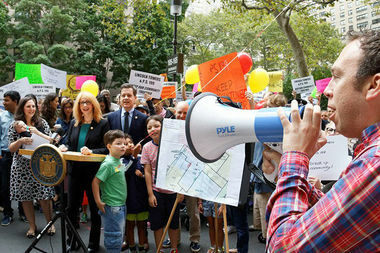 Assemblywoman Linda Rosenthal and state Senator Brad Hoylman attended a rally Saturday with Lincoln Towers residents, who argue that the complex should not be broken apart with children attending different schools. “There are few developments that have helped to shape the Upper West Side more than Lincoln Towers,” Rosenthal said in a release. “Now, the DOE is proposing to tear this strong and historically tight-knit community apart by implementing an arbitrary rezoning plan without demonstrating its rationale." Lincoln Towers residents have noted that their longtime support for P.S. 199 makes it unfair for the city to deprive their children from attending the top elementary school. Community Education Council 3 will vote on the proposed plan in November. You can find more information about what the DOE is proposing here.